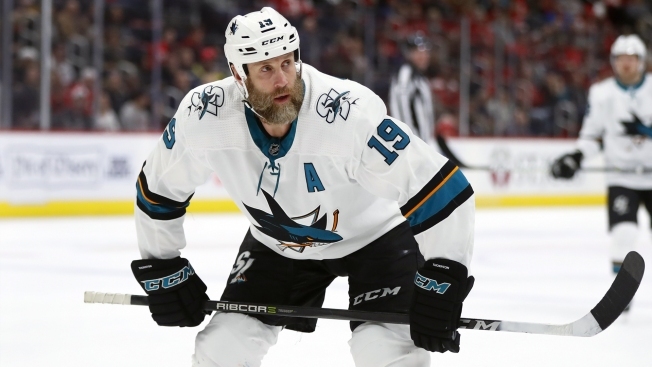 Sharks forward Joe Thornton has been suspended for Game 4 of San Jose's first-round series of the Stanley Cup Playoffs against the Vegas Golden Knights, the league announced late Monday afternoon. Thornton faced a hearing Monday for his illegal check to the head in the Sharks' 6-3 loss to Vegas in Game 3. Clearly, the final call didn't go in San Jose's favor. The 39-year-old veteran was called for an illegal check to the head after hitting Golden Knights forward Thomas Nosek with just over three minutes remaining in the second period on Sunday night. Thornton said the hit to the head wasn't on purpose as he defended his actions after the loss. "I honestly thought I barely touched him," Thornton told reporters in Las Vegas. "He came right back. It was just one of those plays. It is what it is. I think my son hits me like that six times a day. It was just a weird position [Nosek] put himself in, that's all." Golden Knights winger Ryan Reeves, who found himself in quite the tussle with Sharks winger Evander Kane during the game, felt much different about what Thornton did. Reeves went as far as calling Thornton "gutless" to reporters on Monday. "It was gutless. It was behind the play & to the head. I got a buddy with a grandpa who's going through the same thing. Can't really see very well cuz he's getting old. Get some glasses. If he gets suspended it'll be hard for him to see up top." The Sharks are down 2-1 in the seven-game series. They'll look to even it up Tuesday in Game 4 in Las Vegas.